Cloud computing is the future, we're told: you get to access your data from anywhere, and the big companies involved will look after it for you. And there's some truth in that, too, but what if your account gets hacked? Or deleted? The online service could go down for a day or two, lose some data, perhaps even close down, leaving you out in the cold. The reality is it's still a good idea to back up your data, even from the cloud. And fortunately there are plenty of free and easy ways to help you do exactly that. Here are 15 ways to back up your cloud data. Some webmail services include simple ways to back up your data. Windows Live Hotmail, for instance, comes with export options (Tools > Accounts > (select an account ) > Export) to save your contacts and messages. And in Gmail, enabling forwarding (Settings > Forwarding and POP/IMAP) lets you copy incoming mail to the address of your choice. Or selecting "Enable POP for all mail (even mail that's already been downloaded)" allows you to import your current inbox from any PC-based email client. If that's not quite enough then there are third-party tools that can help. Gmail Backup is simple: just enter your login details and it'll back up the Inbox for you. Gmail Keeper has more features, including a scheduler that will backups automatically, but the trial version only backs up one profile and a maximum of 300 emails. Upgrading costs a chunky $29.95. If you're looking to back up your social networking profiles then Teasker looks hard to beat. Just sign up for free, add your login details and it will automatically run a weekly backup of your Facebook, MySpace, Linkedin, Friendster and Bebo accounts, and can restore then if anything goes wrong. It's a very new service, though, and we've seen very mixed reports on Teasker's reliability. 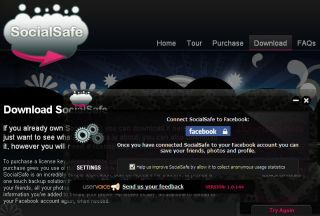 So if you'd rather not take any risks then you may SocialSafe, a more professional tool costing a mere $2.99 that will back up your photos, profiles and list of friends (though sadly not your inbox, groups, apps or wall). Tweet Scan Backup can grab your tweets, replies, friends, followers and more, creating an archive that's easy to view offline in your web browser. Meanwhile BackupMyTweets will proactively back up new tweets every day, then make them downloadable in HTML, XML, or JSON formats. Twistory adds your tweets to a calendar app for easy browsing, and Twinbox lets you receive tweets in Outlook, so you can organise and back them up in the same way that you manage your email. Alternatively, you could simply record your tweet feed with an RSS reader like FeedDemon. The latest version comes optimised for Twitter feed reading with features like automatic hyperlinks and a short uRL expansion view.